I have never climbed a mountain before, never mind climbing the highest one in the British Isles outside the Scottish Highlands, but one can argue that if you are going to start climbing mountains why not start with the highest? (although the Himalayas usually is what springs to mind when we talk about high mountains to climb and maybe one day I will get there). 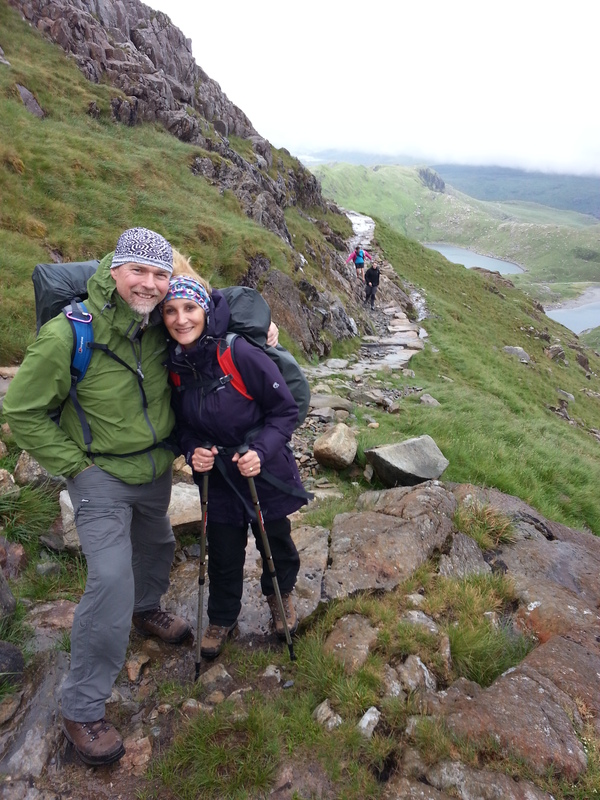 Snowdon has been on my bucket list for ages and it has became even more appealing since my son climbed it last year with his girlfriend Meghan and loved it. From their account it did not sound like an impossible feat for an unfit couple like Brian and I, but let’s just say that I had totally underestimated how hard it was going to be for me. Snowdon Mountain , sitting pretty and magnificent among others in the Snowdonia National Park, the tallest and the fairest of them all, reaching a peak of 1,085 meters from sea level to its Summit. The National Park covers an area of about 823 square miles showcasing a breathtaking landscape of rivers, forests, waterfalls, lakes, river gorges and a mountain range of many peaks reaching over the 915 meters height from sea level. The park has a population of about 26,000 people who live and work there, but it also attracts about 6 million visitors per year, many keen to climb Mount Snowdon and contributing to its reputation of the “busiest mountain in Britain”. I can certainly testify to that, since we climbed it on a Saturday and it was indeed at times rather scary to negotiate a traffic jam that would build up at times at very steep and scary cliff edges, with people scrambling past each other and trying to negotiate who can go first. 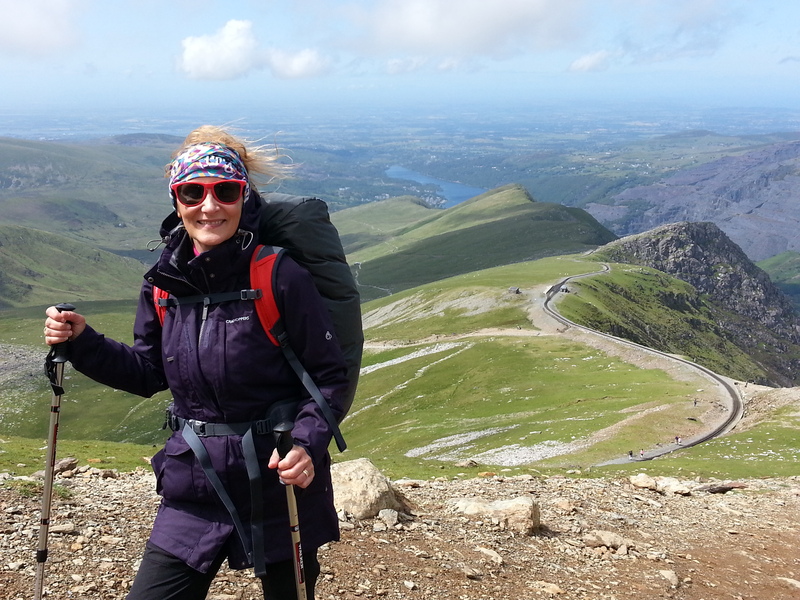 There are different and well established foot paths leading to Snowdon’s Summit, we chose to go up via the “Pyg track” and down via the “Llanberis Path”. We were very pleased with this choice as it allowed us to see so many different facets of this beautiful mountain. The start of the climb is from Pen-Y-Pass car park just off the A 4086. By the time we got there the car park was full, so we had to drive a few miles down the valley to the Park and Ride where we kitted up in the pouring rain and waited for the bus to take us back up tot the top of Pen-Y-Pass. Took a bit of extra time, but it was almost worth it for the entertainment value of the bus driver hauling his big double decker bus up the windy little road, shouting good naturedly at the other drivers (and even the sheep) to get out of the way, I suspect with a few Welsh swear words thrown in for good measure! 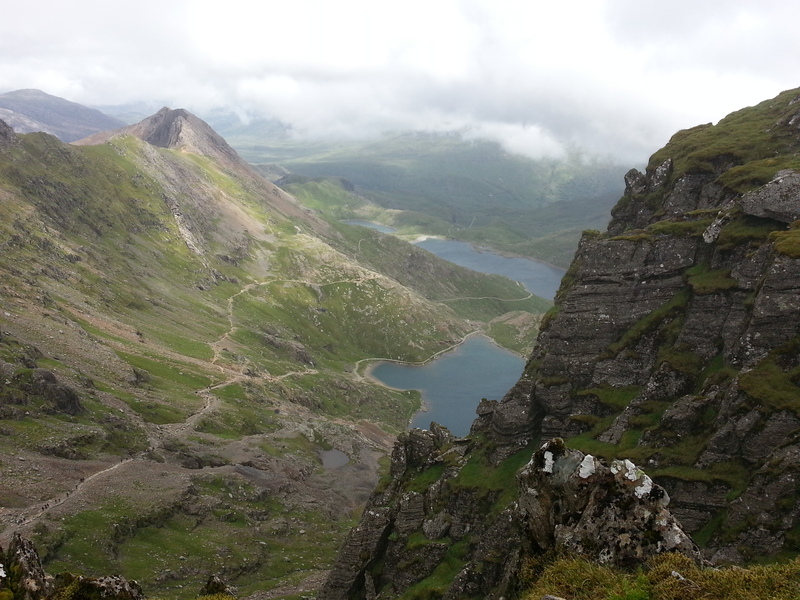 And so we set off up the The Pyg route which ascends 723 meters, and took us about 3 to 4 hours to climb with lots of rest and time for pictures. 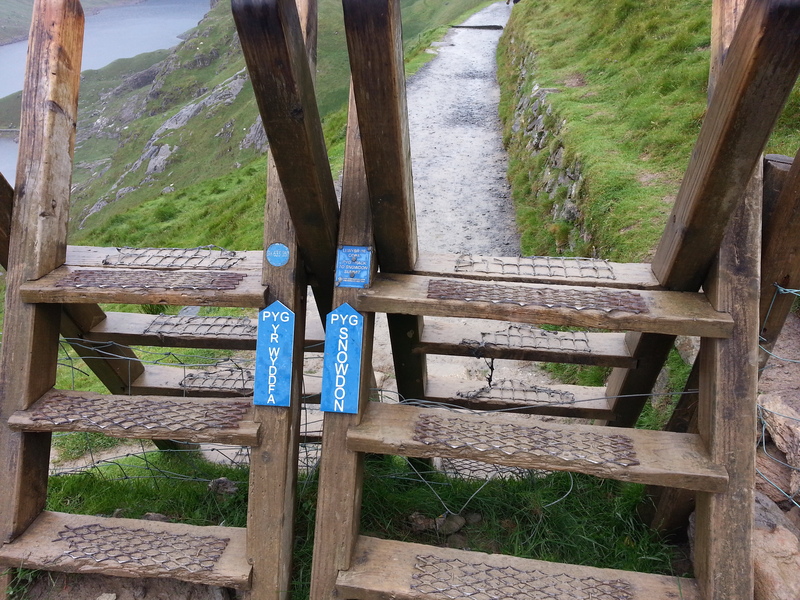 It is graded as a hard mountain walk and they are NOT KIDDING!! 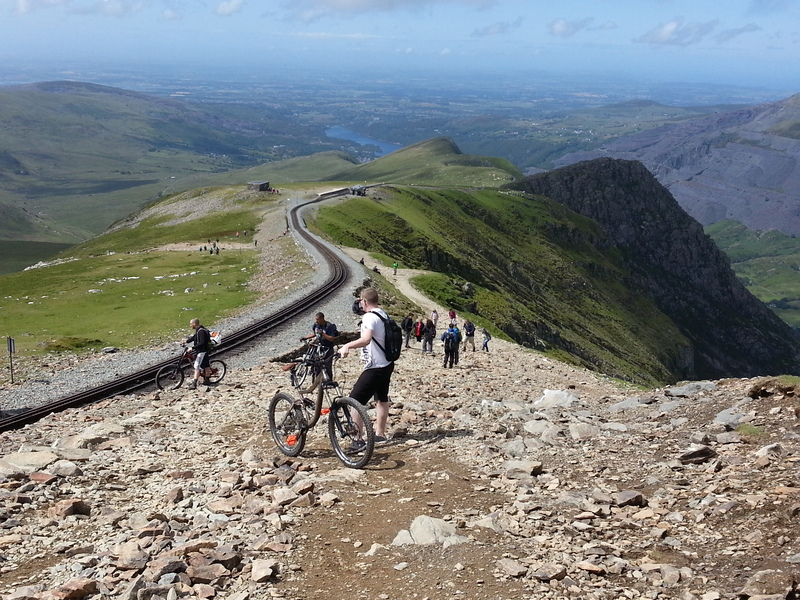 Considered one of the most challenging and rugged of the main six paths to Summit Snowdon. 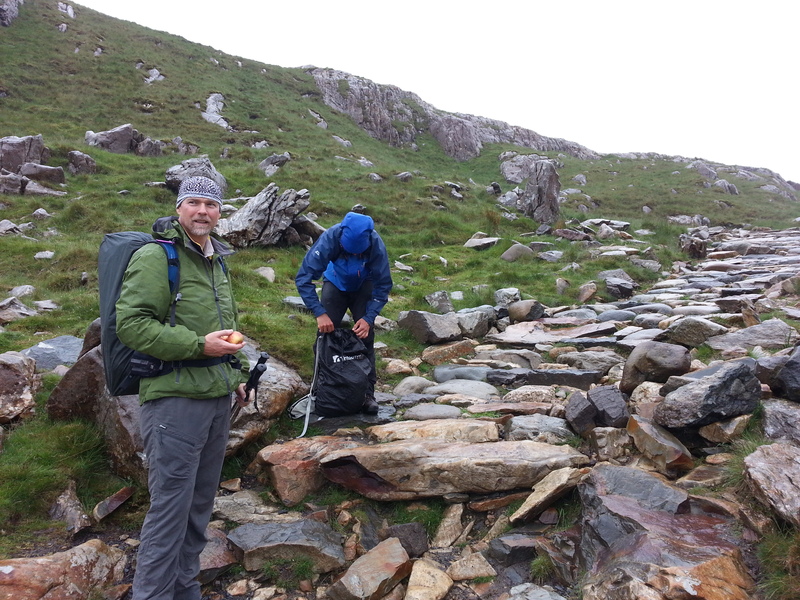 It was raining as we started our ascent, but we didn’t care, we were so excited with our rucksacks strapped to our backs, sturdy walking boots, walking poles, supply of food and water and rain proof jackets. Brian had done lots of mountain climbing back in Scotland when he was younger and made sure we had all the right equipment and safety gear, though the mountain was so busy you could probably rely on all other people in a real emergency. At the start we posed for pictures and Brian offered to take a picture of a family, mum, dad, 2 children and a baby in the father’s backpack. I found it seeing them bravely walking up the path, very reassuring, if kids can do it and happy smiling babies strapped to their fathers back can do it, so can I. It was all smiles at the start, and the weather of rain showers and low clouds only added to the atmosphere and made the dramatic landscape even more so. We crossed a small barrier where the inscription “Pyg Track” was written and from there we started the steadily steeper climb over quite rocky terrain. The views were amazing and there are various lakes; we had dramatic views over to Llyn Llydaw lake which is the largest and deepest lake and which can be crossed by a Causeway. The lakes are formed by glacier erosion and according to Wikipedia ” The rocks that form Snowdon are produced by volcanoes in the Ordovician period, and the massif has been extensively sculpted by glaciation, forming the pyramidal peak of Snowdon”. Apparently Edmund Hillary, practised some rock climbing here in preparation for his successful 1953 ascent to Mount Everest. Sadly I don’t think I will ever attempt the highest mountain in the world, but I am proud of myself for climbing the highest one in Wales. But I do have to confess to being at times very scared on the way up, it was blowing a gale and the fog and rain did not help to lift my spirits. Also seeing the happy family of mum, dad, 2 kids and smiley baby giving up and saying to us that the climb was too dangerous because of the fog, also made me consider my options. There were few people giving up at this stage and some saying that the visibility was very bad and at the Summit we would not be able to see anything. But I was determined to finish, also I did not want to let my son down, he had been at my side from the very start and I felt that he wanted to protect me, his words of encouragement and smiley face kept me going, twice he grabbed me just as the strong winds were about to blow me off the mountain, doing this climb with him and experiencing this of level of commitment towards my safety ( I guess he has no clue about the insurance pay out….) made this experience even more worthwhile. Brian was also close by and wishing me on, he realised the back pack was too much for me and so he took it off me and both him and Jamie took turns to carry it for me to the top. I would have struggled on my own and would possibly have given up, just like many others did on that day. Almost at the Summit, can see the narrow ridge. 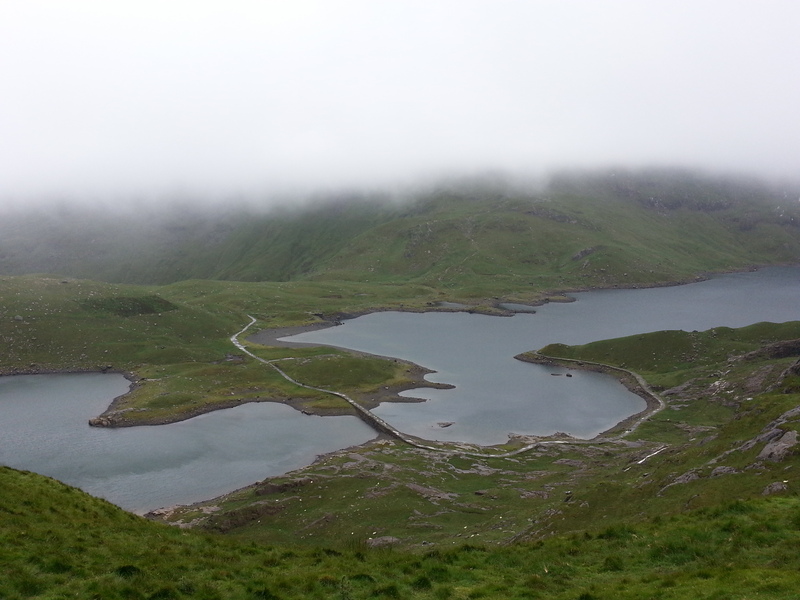 We had walked up the path you can see on the left of the picture, with the summit hidden in low cloud all the way up. Apparently many inexperienced climbers, just like me, have lost their lives attempting to climb this mountain, it is particularly dangerous in the winter when the icy conditions can make it very slippery. The section of the Llanberis Path, beside the railway near the Summit has been called “The Killer Comvex”, since four people died here in February 2009, when they plunged over the cliffs of Clogwyn Dur Arddu. We joined the Llanberis Path at the top and we could see the railway tracks running up the mountain along the right hand side of the path, from here it is another 15 minutes climb to the Summit. 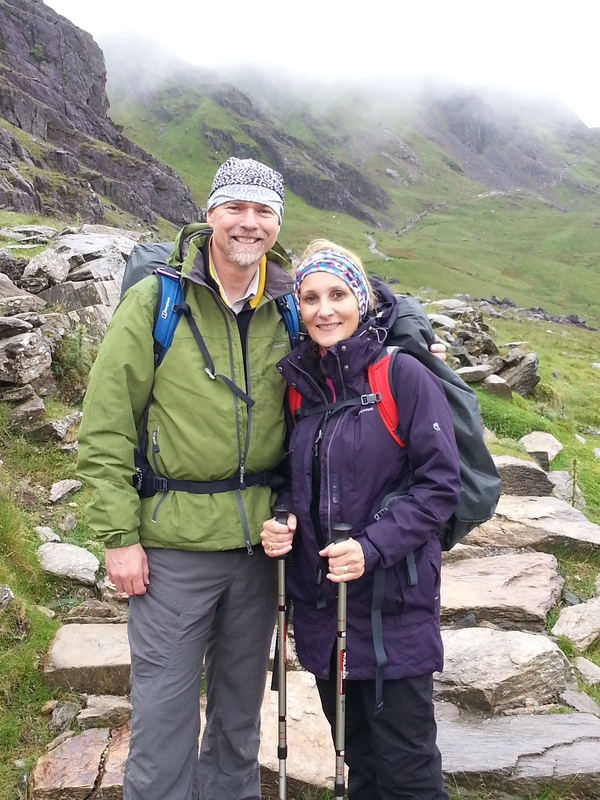 At the Summit the views are breathtakingly beautiful, we left the fog behind and arrived at the Summit with clear views of lakes, the Snowdon Mountain Ridge, a stunning Mountain range of fourteen peaks over 914 meters high. Apparently in a clear day you can even see Ireland, The Isle of Man and the Lake District. We were in awe of this incredible place. The Summit was very busy, but we did manage to take the obligatory photos and although we did not have the Summit to ourselves, it did not matter one little bit, the exhilaration of reaching the Summit, combined with the most incredible views is enough to fill your soul with contentment. For me I had a great sense of achievement, I had just climbed my first mountain! 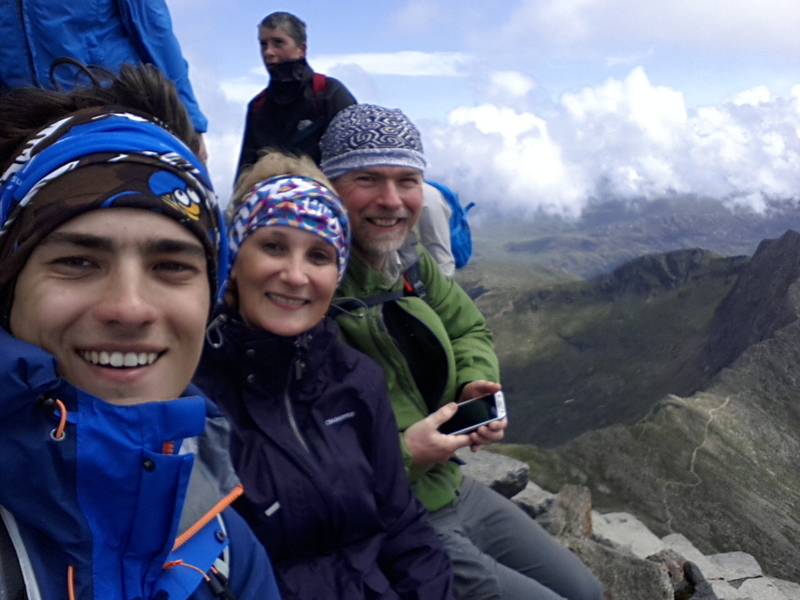 Family selfie at the Summit, only missing our lovely Chloe who could not join us that weekend. There is a Visitor Centre called “Hafod Eryri” at the Summit, built of granite it has large glass windows displaying the most spectacular views, there are also toilet facilities at the visitor centre and a coffee shop with refreshments. The visitor centre has an exhibition that tells the history about this area, built in 2006 and opened on 12/06/2009, to replace a derelict one that was built in the 1930’s. It cost £ 8.4 million to build. We were not able to enjoy these facilities, since it was closed on that day with the railway also not in operation because of the bad weather. The Snowdon Mountain Railway (opened in 1896) is a vintage steam railway carrying passengers up the 4.7 miles (7.6 km) from Llanberis to the Summit Station; a scenic and easy way to appreciate this amazing mountain views. The train was not running when we were there because of the bad weather, although it did start running later on and we saw it going past us in the distance at a very slow speed of about 20 km per hour, but certainly a good alternative. We sat against the granite walls of the Visitor Centre to eat our picnic lunch, courtesy of our son James who had prepared some delicious sandwiches for us. It was great to finally sit down and rest, a great place to people watch, groups of people of all ages, also eating their pack lunches. 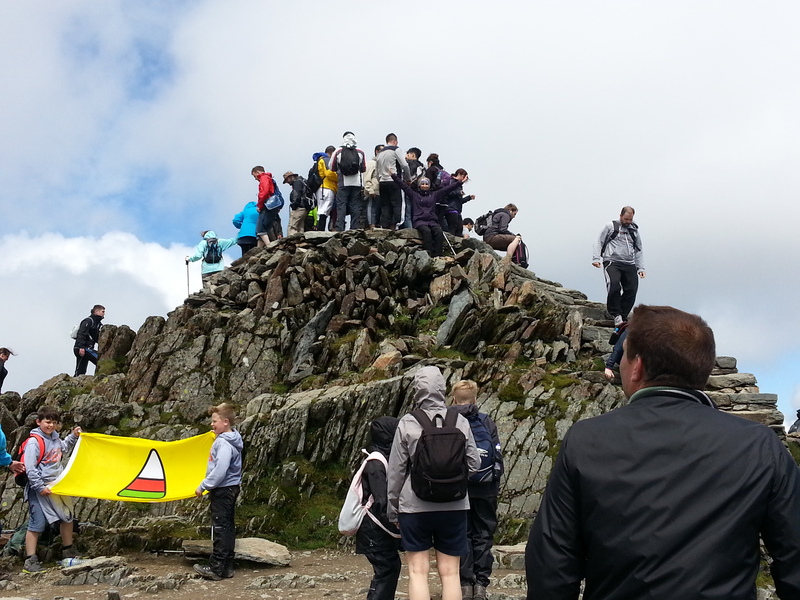 I observed a group of women wearing green T-shirts with the logo of McMillan, which is a cancer Charity, they have clearly Summit Snowdon as a challenge to gather funds for the Charity, certainly a great and very valuable thing to do. We chose to descend via a different route; this path is also graded as a hard mountain walk but it felt a lot safer, with no immediate cliff edges it is thought to be the easiest walk in good weather, although in the winter the highest slopes of the path can become very dangerous. No snow when we were walking down, only magnificent views of Cwm Brwynog, Llanberis and over the Menai Straights towards Anglesey. 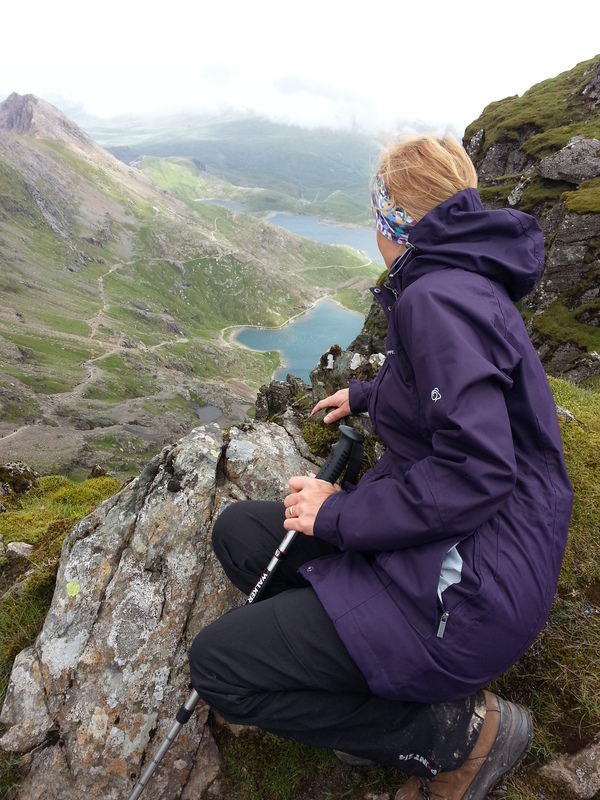 In the distance we could see the narrow edge ridge of Crib Goch, which forms part of the famous Snowdon Horseshoe, it is the most narrow and intimidating of all the paths in this mountain range and should not be attempted by novices, like us. I certainly did not feel tempted to give it a go. Going down is hard on knees and calf muscles, I did use my mountain poles to help me ease the pain. The Llanberis Path ascends or in our case descends 975 metres ( 4.5 miles) and it took us about two and half to tree hours to walk down this very steep gradient, it does go on for ever. We walked past the Railway Station. Cyclists walked up carrying their bicycles, apparently they are allowed to cycle down later on in the day when there are fewer people walking down the path. We stopped at the Half Way Cafe, for a cup of tea and a well deserved piece of cake. After our rest we continued our walk down into the little town and from there we got into a taxi to where our car was parked at the Park and Ride. We were exhausted and could not walk one more step. 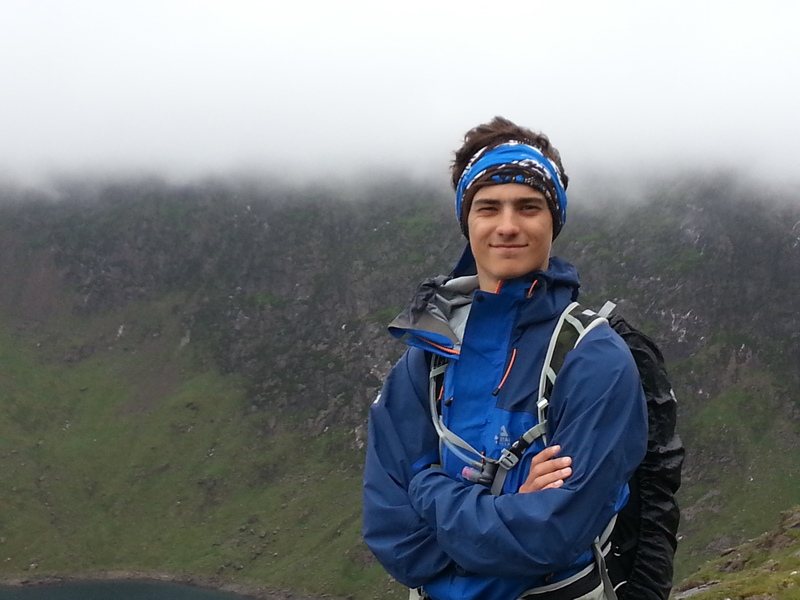 It was altogether about a 7 hour walk and we covered about 8 miles of very steep and strenuous mountain paths. But tough as it had been, I could not have been happier with the day and my huge sense of achievement and sheer joy from spending time amongst the wonderful scenery. 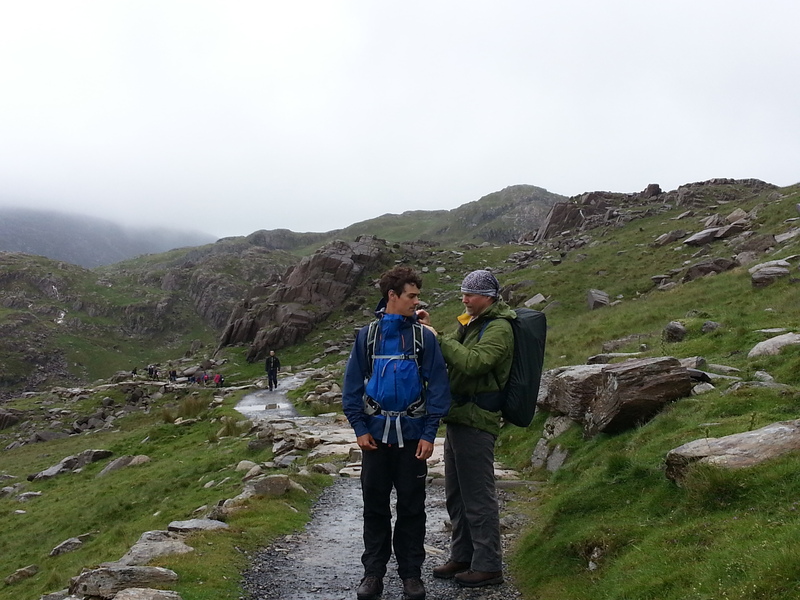 The next morning we caught up with our son Jamie again, since he wanted to show us Moel Siabod (translates as “shapely hill”) a 872 meters high mountain above the charming village of Capel Curig, which Jamie and his University, Geology colleagues have been mapping for the past five weeks. 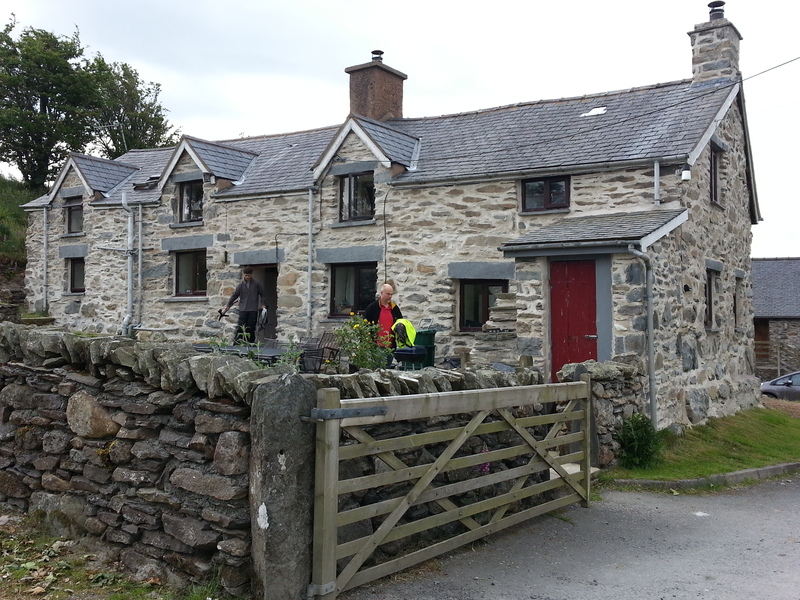 Jamie and another four lads rented a lovely stone cottage in a farm near the town of Betws-Y-Coed from June until July 2015, as part of their University project they had to complete a mapping of the Moel Siabod mountain and surrounding area, totalling 16 Km squared. 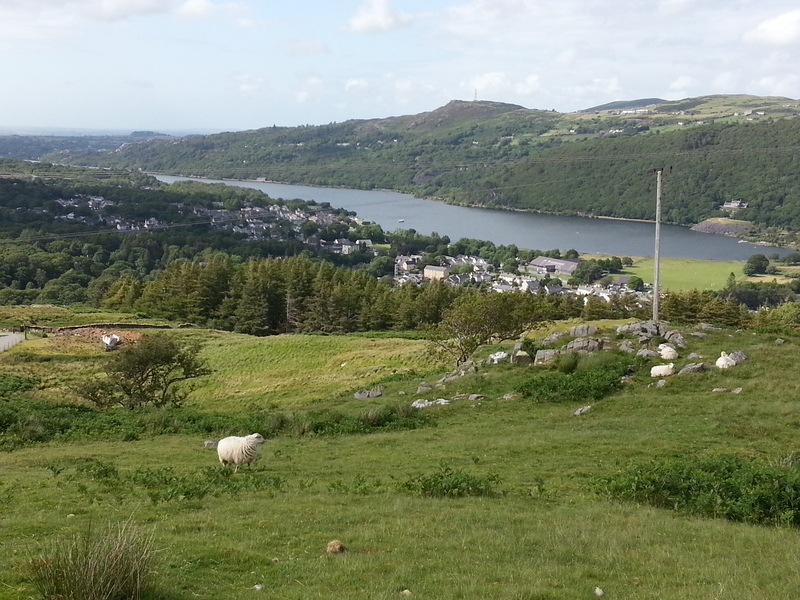 Unfortunately due to lack of time and very sore leg muscles from the previous day climbing we did not climb Moel Siabod, which also looked like a stunning mountain and we said our sad good byes to our son by a lovely lake as he walked on towards his mountain and we began our long drive home. 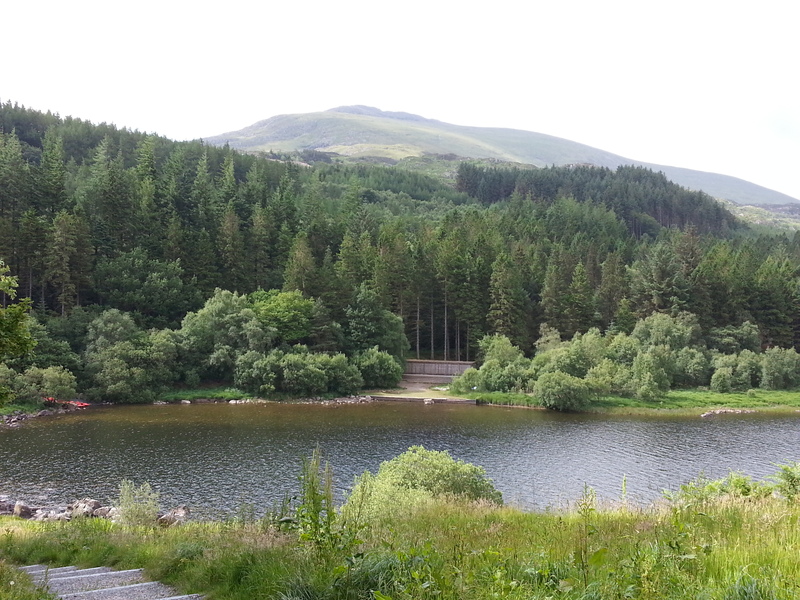 We had visited Snowdonia National Park over a long weekend, arriving on Friday night 3rd of July/2015 and we left Sunday 5th just before lunch time, staying at a lovely and friendly Guest House called Llwyn Onn near the very pretty town of Betws-Y-Coed. There are so many other great activities and mountains to climb in this beautiful region, so we left promising ourselves to return one day for a much longer stay.! Val, thank you so much for your lovely comment. As we have so many times talked about, over a cup of tea, I feel a sense of urgency at getting out there and being more adventurous, since as we get older it will get harder hahaha, but lets keep making the most while we can. That’s a really cute selfie of you and your boys! And the surrounding country is so pretty! 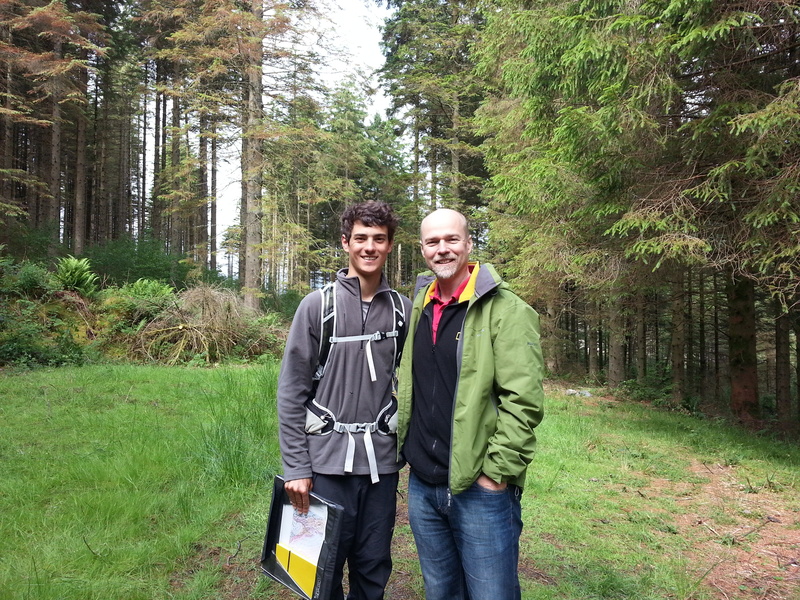 That’s looks to be a really good training opportunity for your someday walk on the Camino de Santiago. The toughest day is the first day, climbing up and over the summit from St. Jean Pied de Port to Roncevalle. 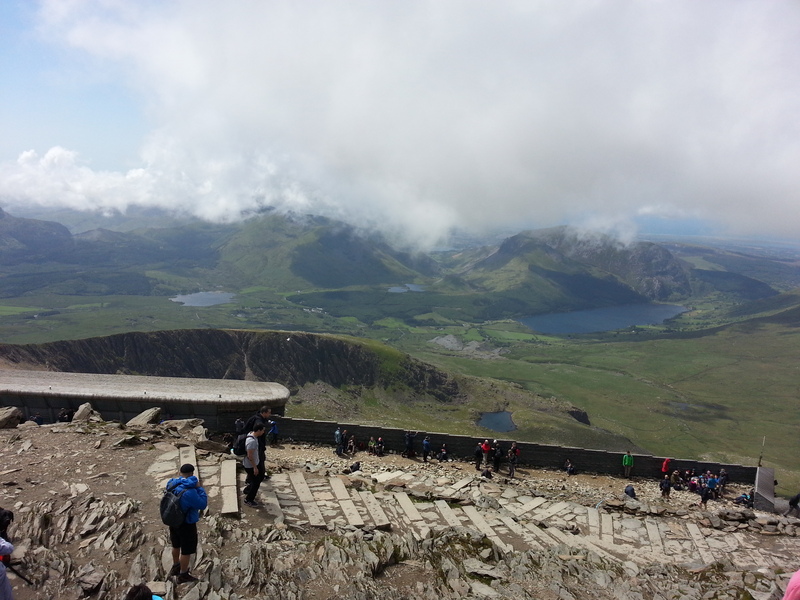 So if you can make the Snowdon climb, you’re good to go! Hi Patti, I am getting quite a taste for long walks and exploring. I would love to do the Camino one day. My boys looked after me all the way up the mountain could not have done it without them. Thank you for your lovely comment. Aline, adorei o Norte to Pais de Gales e a Montanha de Snowdon e realmente incrivel, fiquei muito feliz de ter conseguido chegar no Summit com a ajuda do Jamie e do Brian, foram 7 horas bem duras, mas valeu a pena. Obrigada querida pelo teu comentario. Thank you Amy, it was hard for me, since I am not fit enough. I was in a lot of pain for days afterwards, but the views from the top are amazing, it is a beautiful mountain, you and Andrew would love it. I would like to explore some of South Wales soon and your post about it has inspired me. 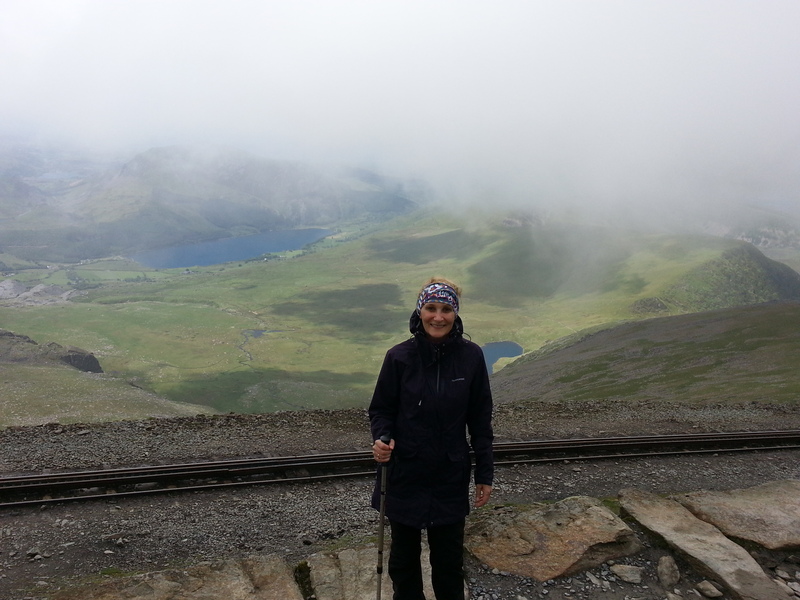 Big congratulations on reaching the summit of Snowdon! You have documented your climb beautifully and your pics are superb. 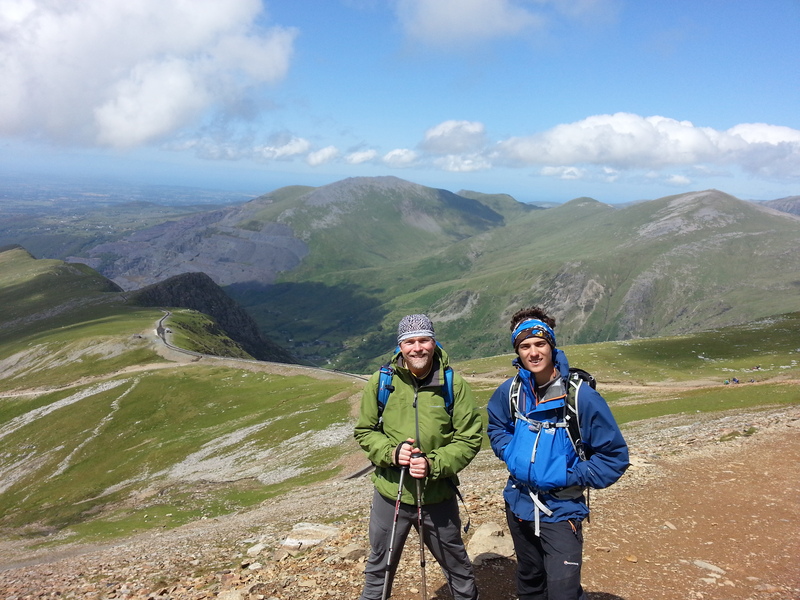 We climbed Snowdon at the end of August 2017 using the Pyg Track for the ascent and the Llanberis Path for the descent. We are very pleased that we varied the route in this way as it gave us a great selection of views. Just a super climb and one we would certainly recommend.